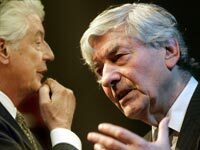 UNITED NATIONS, February 4, updated Feb. 9 -- Wim Kok, the chairman of the audit committee of Dutch bank ING, which received a $14 billion bailout, Wednesday at the UN blamed "the institutions entrusted with regulating" for not having "prevented financial speculation." Inner City Press asked Kok how to allocate blame for the crisis between the regulators and the banks and their directors. Did the regulators make ING buy, and Kok to presumably oversee the buying of, subprime mortgage and other derivative securities? Video here, from Minute 19. Kok acknowledged that he saw the crisis and bailouts "like all of us," but also "from a special position," then blamed not only the U.S. regulators but also the "climate" and the "bonus and compensation culture." Video here, from Minute 20:02. But what was Kok's own compensation? Kok said that "in all fairness, it is too early to give an accounting of how it happened." But why then did the UN, and its Commission on Social Development, present Kok as the one to read out the blame-the-regulators speech? Yes, Kok served as Dutch prime minister. But a director of a bank receiving a multi-billion dollar bailout should not be surprised to be questioned about it. Messrs Kok and Ruud Lubbers, "only at the UN"
"In all fairness," to use Kok's own phrase, Inner City Press asked him about the role of financial speculation in driving up food prices in part of 2008. Kok replied that while prices have declined, they could rise again due to inflation caused by, yes, the bailouts. As to how speculation could be stopped by the UN system, he did not answer. Whether ING itself speculates in food or agribusiness stocks, as with Kok's compensation, is not known at deadline. Appearing along with Kok was the chairwoman of the CSD, Finland's Ambassador to the UN Kirsti Lintonen, who answered Inner City Press' question about whether the theme of the CSD conference, social inclusion, meant that indigenous groups should be "integrated," whether they consent to it or no. Ambassador Lintonen replied that the new Declaration of the Rights of Indigenous Peoples provides protection. Afterwards, a representative of the Madrid Club, on whose behalf Kok had formally be speaking, told Inner City Press that the word integration wouldn't even have to be used if it were achieved. Listed as at the press conference -- even still listed as present on the podium by the UN TV archives web site listing -- was the UN's coordinator of the Permanent Forum on the indigenous, Elsa Stamatopoulou. But on February 9 a UN staffer told Inner City Press that while Ms. Stamatopoulou was listed on the press "release, it was not her on the podium. Rather, "Paula Risikko, Minister of Health and Social Services of Finland, was the third person at the podium during the press conference on 4 February at the opening of the Commission for Social Development. You must have mistaken her for Ms. Stamatopoulou." Duly noted. We'd still like Ms. Stamatopoulou's comments on concerns about opting out of "social inclusion," in light of her role with the Permanent Forum. Watch this site. Not present, but listed on the press release, was a representative of the African Union. Downstairs in the conference room where the conference is taking place, a representative of Sudan speechified about the connection between social development and human rights. Only at the UN, one wag said, only at the UN.